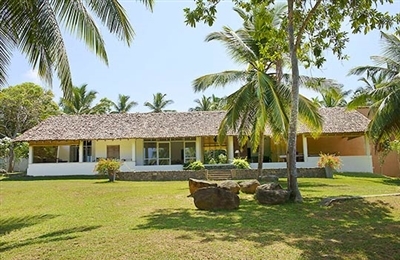 For a lazy, languid holiday where you come armed with a stack of books and great company, Blue Heights is the business. The simple design and minimal interiors are unfussy and free of distractions so that you focus on the job at hand – relaxing, catching up with friends and family and absorbing the restful environment. The ocean views and hilltop locale create a feeling of space and the convivial pool area, with sunset-worthy jacuzzi, soon became one of our favourite spots. The open-sided dining area made the most of the views and even from the glass-walled lounge you can spy the sea whilst watching TV. Those staying in the master bedroom do get a lot more value as the room is huge and is attached to a little private lounge with pergola roof, although the bathroom is rather narrow. The bedroom in the main house works well for elderly relations or independent couples. The staff, a husband and wife team, plus houseboy, were very welcoming – as was Timmy, the house’s loveable dog! Service is casual and their English was limited so communicating was a bit of a struggle at times. 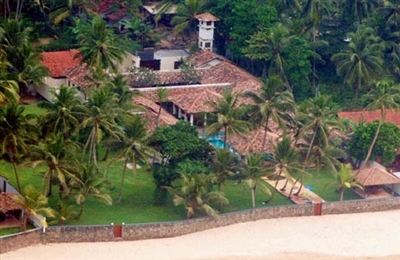 However, the villa is looked after by a management team whose area manager is always at the end of the phone. The kitchen is basic and uninspiring, however there is a little pantry with sink and fridge for making drinks. 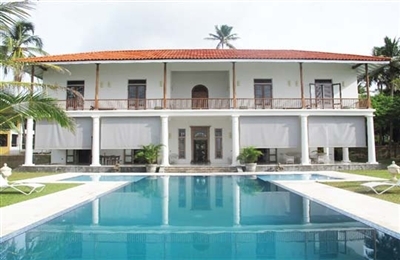 In any case, a cook prepares all of your meals (Sri Lankan cuisine mainly, plus a few fried rice and noodle dishes). Note that the beach is not at the end of the garden – you need to go through the gate, turn right along the road and then wander for five minutes to the beach. Swimming is best in the middle of the bay. 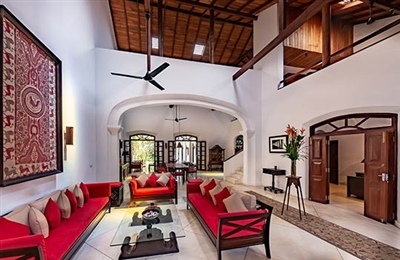 Without doubt, this is one of Sri Lanka’s most engaging villas and in one of the most breathtaking locations on the island – the views are nothing short of spectacular. 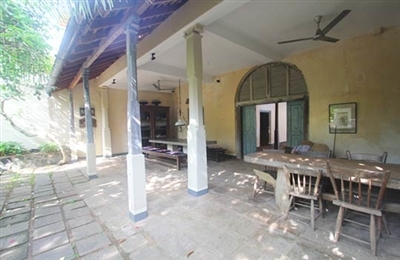 Its links to Geoffrey Bawa and its interesting, yet short, history makes a stay here all the more engaging. The house itself is fairly modest – there are no fancy mod cons and the simple yet imaginative design evokes the past as much as the present – however the new owners are currently upgrading the house. The interiors have already been given a sensitive facelift, and look lovely, whilst two more bedrooms and a TV lounge are due to be completed by the end of 2014; they were renovating existing buildings for these behind the main house at the time of our visit (March 2014) but we were not disturbed by the work at all. Our favourite place to pass the time was around the main swimming pool (there is a second pool to the side of the property, close to the driveway). This cliff-top pool complements the house – it’s been here for a few decades and we liked its old-school geometric design. The different shades of blue reflected the sea beyond and the terrace surrounding it was scattered with sun loungers and beanbags, one of which was placed on a protruding corner from where we could sit and watch surfers in the bay below. A little staircase leads down the hillside to the beach, and it’s a lovely spot for long strolls, swimming or body boarding (there’s a big collection of boards in the house) with care for much of the year – the sea is fairly shallow. The staff really went out of their way to ensure that we had everything we needed, in particular the lovely chef who produced some heart-warming food. We recommend his rice and curry, which we enjoyed by candlelight down by the pool. Make sure you have a chat to the maintenance manager who’s worked at the house from the very beginning. He showed us some 25-year-old photos of the house. 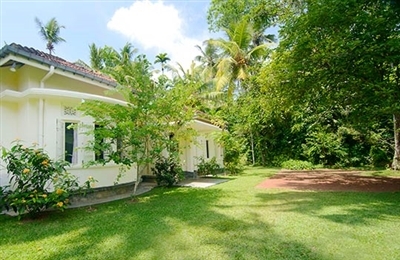 Coconut Grove is a wonderful retreat which, despite its privacy and modern additions, including a swimming pool, offers a chance to experience life in an authentic Sri Lankan village. That said, we noticed on our recent visit that the area is seeing quite a lot of development in terms of small hotels and villas; the plus side of which being that the number of tourist-friendly restaurants is likely to increase. The cottage is perfectly set up for families, especially as the two rooms to the front of the house have smaller double beds (or large singles), which would be perfect for children. 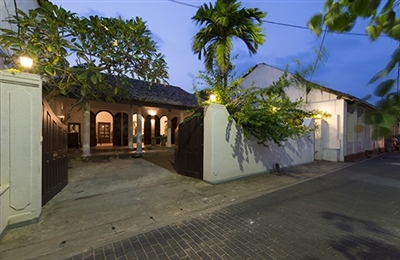 However, it would be an equally good choice for a group of friends wishing to stay a little off the beaten track. The living areas – both inside the house and outside in the garden – offer plenty of cosy places to relax and private pockets for escape. The wildlife is magical here, and right on your doorstep. Whilst sipping afternoon tea in the poolside pavilion we watched monkeys playing in the trees as birds twittered melodiously overhead. The large lawned garden is a fansasyland for roaming kids but supervision is necessary around the pool as it quickly gains depth. The staff kept the house clean and tidy during our stay, and were on hand to assist us with anything we needed. The staff do not stay in the house at night although the gardener/watchman lives in a small building tucked independently to one side of the property. If the housekeeper is not needed to assist with making afternoon tea or dinner, you can dismiss her early and enjoy the run of the house all to yourselves.